Nine Million New Catholic Reverts in 2013? Since 2000, the Catholic Church around the world has added about 15 million new Catholics each year. In 2013 it added 25 million, according to recently released Vatican statistics. This is interesting as it coincides with the year Pope Francis began leading the Church. 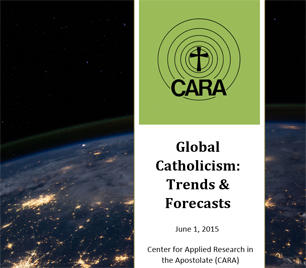 CARA recently released a report on global trends in the Church since 1980. After that report was released we got our 2013 copy (i.e., most recent) of the Annuarium Statisticum Ecclesiae (ASE). This book represents the Vatican’s awareness of the state of the Church on December 31, 2013. The table below updates key data from our recent global report. In the same year as the big jump in Catholics, the Church increased its number of parishes, priests (diocesan and religious), permanent deacons, secondary students in Catholic schools, and adults entering the faith. At the same time, losses continued among religious brothers and sisters and numbers for many sacraments dropped below levels of the prior year. Some of these changes are related to changing patterns of fertility. Fewer children born to Catholic parents means fewer infant baptisms. Others require more explanation. Why the decline in enrollments in Catholic higher education? How to explain another year with fewer marriages in the Church? Because the totals are for the world population a jump in Catholics beyond new entries to the faith can only occur with former Catholics coming back. Immigration isn’t a factor on a global scale. 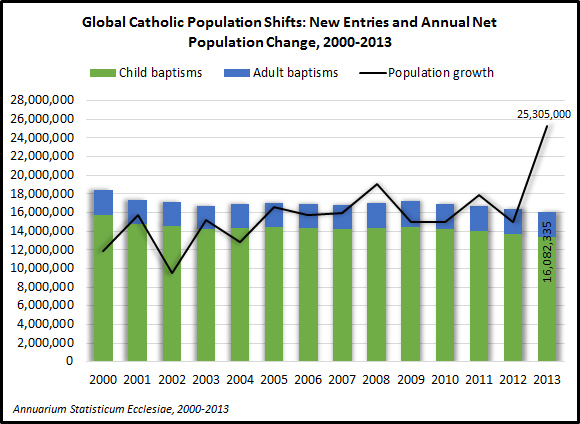 In most years since 2000, the number of baptisms (adults and children combined) have been greater than the net growth of the Catholic population. Some people leave the faith every year. Others leave earthly existence (i.e., die). CARA has always known that there are reverts in the population and in the pews. Former Catholics regularly become Catholic again at some point in their life and make up about one in ten Catholics in the United States according to CARA’s national surveys of self-identified Catholics and surveys of Catholics in in the pews at U.S. parishes. 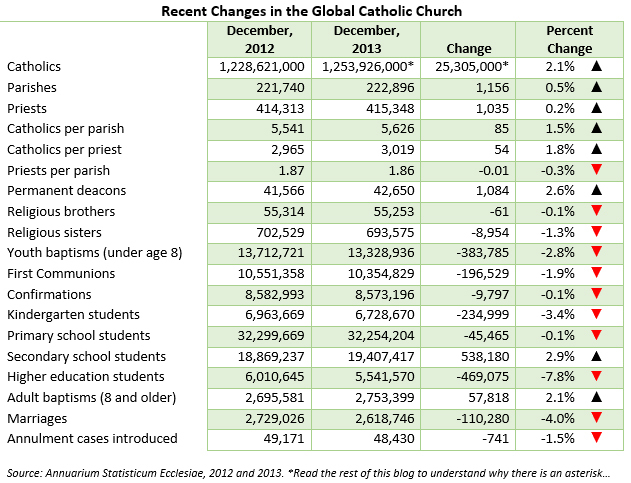 But did 9.2 million former Catholics rejoin the faith globally in the 12 months of 2013? Perhaps. After all this would really only represent 0.7% of the global Catholic population of 1.25 billion. Is the 9.2 million figure related to a typo? Not in a classical sense of a “fat finger” hitting the wrong keys and then being missed by editors. There truly are “considerable” differences in how dioceses and national conferences estimate the number of Catholics residing in their borders. It’s much easier to know the number of priests or number of baptisms in a given year. But how does the Church know how many Catholics reside where? With polling widespread and many national censuses asking a religious affiliation question, good social science data is often available...but not always used. In some cases dioceses and national conferences appear to rely on rules of thumb. After closely examining the data for each country it is evident that one of these is Mexico—the second largest Catholic country in the world. 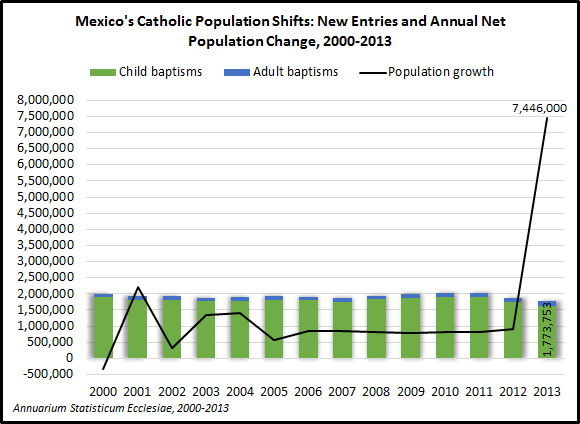 Starting with the 2006 ASE, respondents for the Church in Mexico began to assume that the total population of the country was growing by about 0.8% a year and that Catholics made up 92% of that population. These same assumptions were used year after year through the 2012 ASE. At that time, the ASE was reporting a total population in Mexico of 110,292,000 and a Catholic population of 101,350,000. Perhaps someone then pointed out to the respondent for Mexico that the total population for Mexico in 2012 had actually grown to more than 118 million people (annual population growth averaged 1.4% since 2006 rather than the assumed 0.8%). The total size of Mexico’s population was corrected for the 2013 ASE but the assumption that 92% of this population is Catholic remained in place. Thus, in a single year the Catholic population of Mexico increased by nearly 7.5 million although only about 1.8 million new entries to the faith occurred in the country during that same year. This single “adjustment” results in much of the one year leap in the newly Catholic population that cannot be accounted for by new entries into the faith around the world. Other survey and census estimates indicate that the Catholic percentage of Mexico’s population is closer to about 85% rather than 92%. The most populous Catholic country, Brazil, may also have contributed to the jump in the new Catholic population. Here, only 1.5 million new entries to the Church were registered in 2013 but the estimate for growth in the Catholic population in that country is nearly 3.8 million. It is possible that World Youth Day could have drawn some former Catholics back in Brazil. There were more than 3 million people on the beach for the final Mass. However, it may also be related to another rule of thumb. Church respondents in Brazil consistently assume that about 84% of the population is Catholic. However, this figure is likely 75% or even lower. Overall, the higher than expected population totals for Mexico and Brazil are counter-weighted somewhat globally by the Church not reporting estimates for the size of the Catholic population in China. In 2010, Pew estimated this to be about 9 million. Many European and North American countries also underestimate the sizes of their Catholic population and more commonly report parish-affiliated totals, thus leaving out numerous self-identified Catholics who do not regularly attend Mass. On balance, the global total for Catholics reported in the ASE is likely quite accurate. However, the anomalies at the local and regional levels leave the Church with a slightly distorted view of where the world’s Catholics are. In 2013, the number of new Catholics added globally likely falls short of 25 million and is probably closer to the 15 million added in previous years (...including some unknown number of reverts). Most of what is reported in the ASE is easily tallied. Dioceses and national conferences can know the exact numbers of childhood sacraments, ordinations, and annulment cases introduced. The one fuzzy number is always Catholic population. It is clear that many in the Church have turned to more reliable social scientific methods for estimating this. Hopefully, rules of thumb will be used even less often when reporting the 2014 population data. 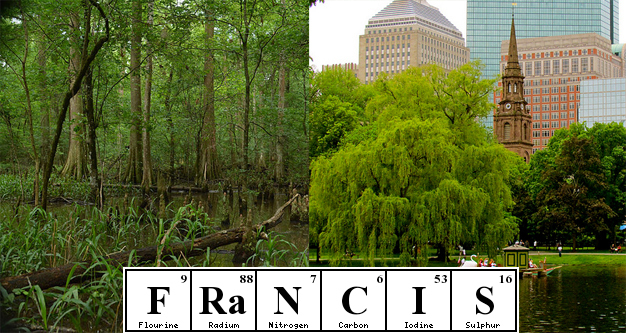 Pope Francis is scheduled to release an encyclical on the environment Thursday. 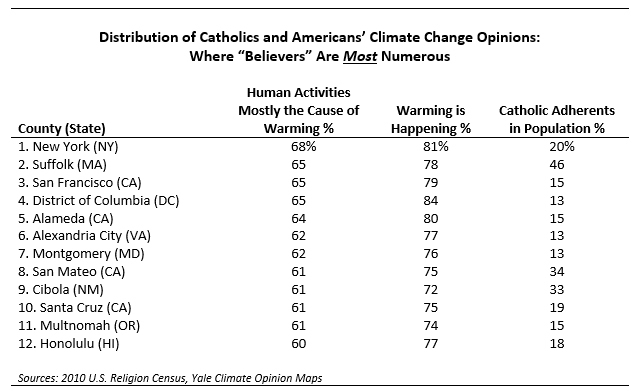 Earlier today, some new survey data from Pew provides the most recent insight into what Catholics think nationally about climate change (and Pope Francis). We can also use survey data to understand how the encyclical might impact local communities. Where will the work of pastors perhaps be easier than in other places in America? Yale researchers have aggregated surveys with sufficient sample sizes to allow for localized analysis to the county level. The table below shows the counties where the most American adults believe warming is happening and that human activities are mostly the cause of this change. The last column of the table shows the size of the Catholic adherent population (i.e., those who are active and parish-affiliated) as a percentage of the total population in each county from the 2010 U.S. Religion Census. One county stands out—Suffolk County, Massachusetts, which includes Boston (shown on the right in the image above). 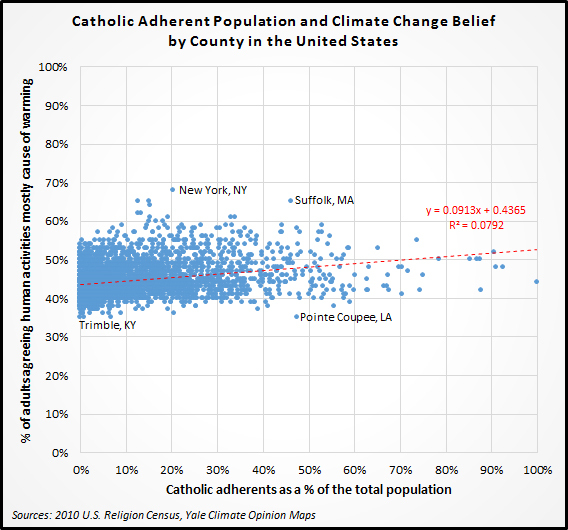 Just below New York City in terms of belief in climate change, it is the most Catholic of the climate change believing counties with Catholic adherents making up 46% of the population. Where might there likely be more resistance to the encyclical? The table below shows the dozen counties with the lowest levels of belief in climate change. Once again one county (…that is “parish”) stands out—Point Coupee, Louisiana (shown in the left in the image above). Similar to Suffolk County just under half the population are Catholic adherents. Here though, a minority of the population believes warming is occurring and just more than a third believe human activity is primarily causing warming. 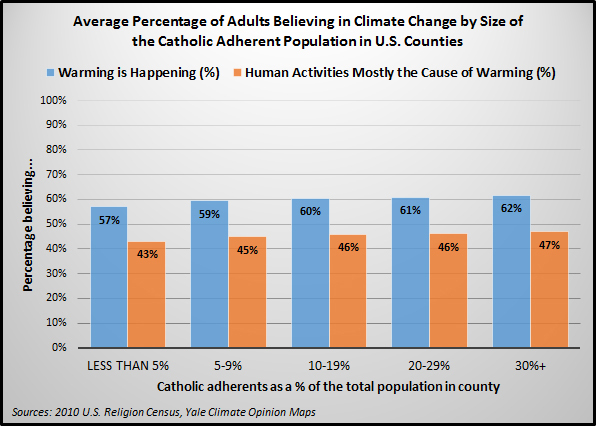 The figure below shows these data for all counties in the United States for Catholic adherents and for the percentage believing human activity is causing warming. There is a weak association between the two. 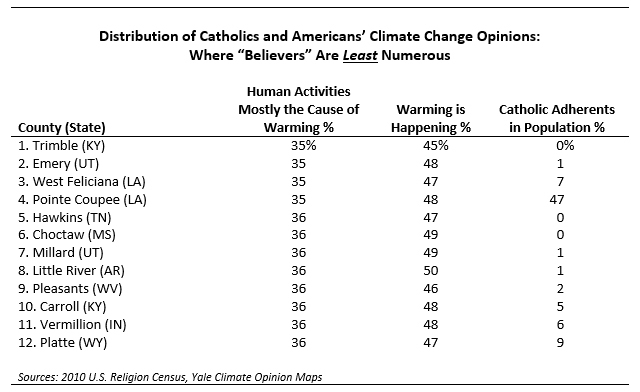 As the Catholic adherent percentage increases so too does belief in human-caused warming. This is easier to see in the second figure showing average belief by five different Catholic adherent population levels—from less than 5% to 30% or more. Belief subtly slopes up across the figure left (lower numbers of Catholic adherents) to right (higher levels of Catholic adherents). How can Pope Francis speak about matters of science? From time to time popes are called upon to comment on current and in this case predicted future events. However, when doing so they always run the risk of critics countering that they are not qualified to speak on these matters. When Pope Francis speaks critically about some aspect of capitalism I can always count on hearing “He’s not an economist.” Similarly I’ve heard several people say that Pope Francis should stay out of matters of science. For example, in January, conservative radio host Michael Savage said on air, “Suddenly the pope, who has no background in science, is saying that global warming is the biggest threat to mankind.” Mr. Savage seemed to be unaware that Pope Francis actually has a science background. One could argue he is just as qualified as the seemingly omnipresent Bill Nye “The Science Guy” to comment on this issue. While Nye has an undergraduate degree in mechanical engineering (…a bow tie, legacy of being a children’s show host), Pope Francis has a technical degree in chemistry and spent time working in laboratories before entering the seminary (...not a graduate degree though as has been reported). On a more macro level, the Church is typically viewed as an enemy of science and as recently pointed out by the Associated Press this is a rather uninformed point of view. Regardless, I am sure references to Galileo will be common on Thursday. As a scientist it makes me cringe whenever I hear this phrase (most often uttered by politicians rather than scientists). In reality science is never settled. Newton was right about gravity... and wrong. We didn't understand this until Einstein introduced general relativity. More wrinkles in physics have been added by quantum mechanics. String theory may contribute more nuance. If you asked scientists in the mid-1700s if Newton was correct and his work was “settled science” they would have agreed with you. Yet they knew so little. That is why science is not done by simply taking polls of scientists. All that matters is observations, data, and evidence. It is a beautiful system that always self-corrects in the long-term. If someone can’t replicate your work you will eventually be disregarded. There is no need to brand people as a “denier” for questioning current climate science models. No need to reinvent the inquisition! If someone is saying something that doesn’t fit the evidence simply prove them wrong. Ad hominem attacks are by their very nature unscientific. The biggest challenge with climate change is complexity. We know what greenhouse gasses do in the laboratory. But the real world has many more variables than we can incorporate in the lab and some of these variables are rather unpredictable. Rather than being settled science I would consider the current state of climate research to be “normal science.” As Thomas Kuhn explained in the Structure of Scientific Revolutions (1970), “Normal science, the activity in which most scientists inevitably spend almost all their time, is predicated on the assumption that the scientific community knows what the world is like” (p. 5). This is a period that emphasizes group think and agreement between scientists. It is a defensive phase (e.g., branding others “deniers”). Normal science is sometimes changed, advanced really, by scientific revolutions. Periods where new discoveries can no longer be ignored and existing theories and models either fall away or survive incorporated into a new understanding of reality. Our current understanding of climate change, and all the predictions derived from it, may end up being absolutely correct. But any scientist knows that we cannot be absolutely sure of this. Therefore the term “settled” is more of a political notion than a scientific conclusion. Yes. Both. There have been periods where the world has warmed more quickly and in closer connection to changing levels of greenhouse gasses in the atmosphere. 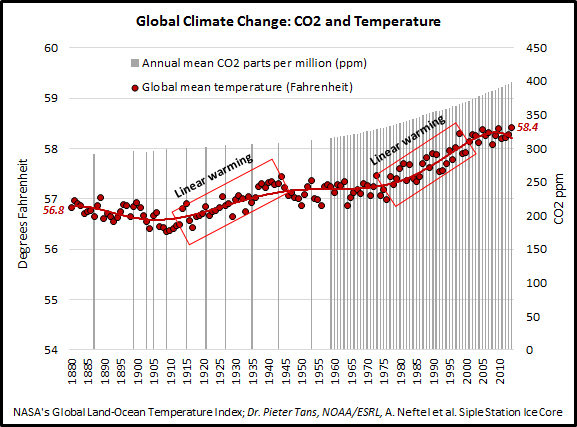 Where one sees carbon dioxide increase and the temperature increase together, expected linear warming can be observed. However, other periods have shown expanding carbon dioxide levels without corresponding increasing temperatures. Again this speaks to the complexity of climate with other non-human factors being important as well such as solar activity, volcanic activity, oceanic absorption, etc. However, even in a “pause” it is still the case that it is warmer now than in the recent past and this sustained reality continues to impact the environment. Most climate scientists are concerned that the current pause will soon break and we will again see periods of linear warming or even worse a big leap in temperatures in a chain reaction event (i.e., methane releases in the Arctic). The fact remains that one can predict the global mean temperature pretty well by just knowing the amount of carbon dioxide in the atmosphere (r-square of .895). And if that current correlation continues to be true into the future the global mean temperature would be expected to increase above 60 degrees Fahrenheit by the end of this century. Perhaps even more if there is a chain reaction event or more dire predictions from models come true. Yet, skeptics also can show that some of the more dire predictions from the late 1990s failed to appear by 2015 as was expected. Will the encyclical move the Church in a different direction? I haven't read it yet. But I do know that the Church has already supported protecting the environment for many years. For example, in 2007, the United States Conference of Catholic Bishops (USCCB) called for “careful stewardship of the earth and its natural resources” and noted that “care for the earth and for the environment is a moral issue. ... Our Conference offers a distinctive call to seriously address global climate change, focusing on the virtue of prudence, pursuit of the common good, and the impact on the poor, particularly on vulnerable workers and the poorest nations.” The media may portray the encyclical as a change in direction but it will likely be understood within the Church as part of a longstanding commitment to protect the earth and environment. There is no shortage of statements from recent popes on this issue. The biggest impact of the encyclical may be in its elevating the Church’s existing concerns on environmental matters to a higher level. This will likely be well received in Suffolk County, Massachusetts and perhaps less so in Pointe Coupee, Louisiana. Images courtesy of Ron Kikuchi and Jeff Gunn. In the previous post, CARA released a new report on global trends in the Catholic Church since 1980. These data reveal that there were 1.4 million fewer marriages celebrated in the Church around the world in 2012 than in 1980 (2.7 million compared to 4.1 million or a decline of 34%). This occurred after the Catholic population had grown globally by 57%. Some might not also realize that fewer marriages have also resulted in fewer annulments. 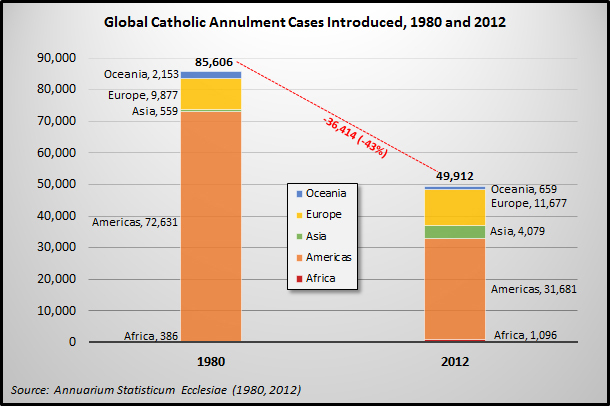 In 1980, there were 85,606 new annulment cases introduced and 84% of these were from the countries of the Americas. More specifically, nearly 80% of the world's annulment cases introduced that year came from the United States. Overall, the number of annulments introduced annually has fallen by 43% since 1980 and in 2012 the total number of cases introduced was down to 49,912 of which 24,010 came from the United States (49% of the world total). Generally, the number of annulment cases from the Americas and Oceania are down while the numbers from Europe, Asia, and Africa are up. There have been some changes to the annulment process since 1980. Now an initial annulment finding (first instance) is reviewed (second instance) before it can become confirmed. To keep the data as comparable as possible the table below compares annulments in 1980 to decrees of nullity for the first instance in 2012. The focus in this table is on cases where a decision has been made whereas the figure above focuses on new cases introduced (many cases cross over from one year to the next). 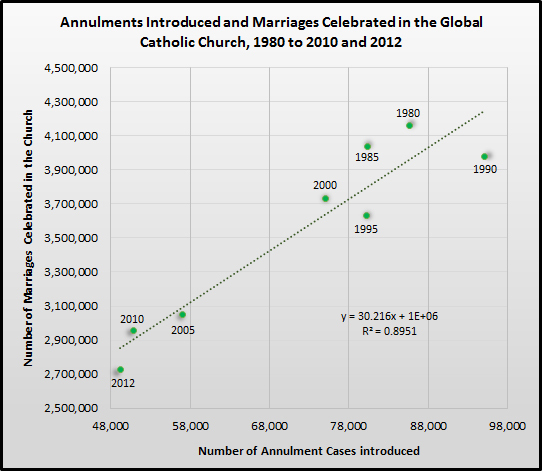 In 1980, 89,065 annulment cases were closed and 68,787 annulments were granted. Thus, annulments made up 77% of all cases closed. That does not mean that in 23% of cases the Church found no grounds for annulment. In many cases the parties quit the process at some point without the Church ever making a determination (e.g., they may reconcile or no longer have interest in an annulment). In 2012, 49,417 cases were closed (...moving on to the second instance) and the Church ruled in favor of nullity in 40,811 of these cases (83%). There is some regional variations in the likelihood of receiving an annulment. Only 61% of closed cases in Africa resulted in annulment compared to 86% of cases in the Americas. However, this is not because tribunals in Africa were more likely than those in the Americas to rule contrary to nullity. It is more a reflection of more people seeking annulments in Africa than in the Americas not completing the annulment process. As shown in the figure below, when the number of marriages in the Church decline so do the number of annulment cases. How can sacramental practice become less common even as the Catholic population continues to grow? One could easily jump to conclusions and consider this to be solely a reflection of "secularization" or a growing preoccupation with the digital world. Yet there is a bit of demography behind these changes as well. The world's population is aging and you only get baptized or have your first communion once. People are living longer, healthier lives. It is this extension of life that is leading to population growth (...not births as it is so often assumed). Since 1995, now, and through 2050 we have and can continue to expect there to be about 125 million to 134 million births per year worldwide. At the same time, according to the Census Bureau's International Data Base, in 1995 average life expectancy at birth globally was 63. Today it is 69 and in 2050 it is expected to be 76. If a population has fewer children it will also have fewer baptisms and then fewer marriages, etc. The cycle feeds on itself generation to generation. Few notice any changes in the short term because all this occurs as life expectancy gains boost overall population numbers. Sacramental numbers will inevitably wane given these demographic shifts. Annulment cases will also likely continue to fall regardless of any changes that might be made to the process. This post includes the first section of a CARA report that presents a global overview of trends in the Catholic Church (download the full report with regional analyses including trends for the workforce of the Church, sacraments, education, lay ministries, and welfare institutions). Although the world is rapidly evolving in a digital age, it is still the case that Catholicism, more often than not, takes place in brick and mortar. The sacramental focus of Catholicism—especially the regular reception of the Eucharist—means that much of the faith “happens” among Catholics in parishes with priests. One cannot go to confession online or be married at the beach. Arguably, the three most important indicators of “vitality” for the Catholic Church are the number of Catholics, the number of parishes, and the number of priests. 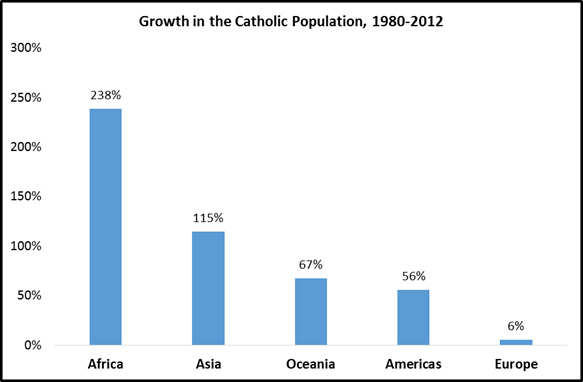 Overall, the global Catholic population has grown by 57 percent since 1980. However, this growth differs by region, with Europe’s Catholic population growing by just 6 percent while the number of Catholics in Africa grew by 238 percent. Differences between these two regions are largely attributable to differences in fertility rates over time. In 1980, the European total fertility rate (TFR or average births per woman over her lifetime) was 2.16. This is just above the replacement rate of 2.1 where two parents re replacing themselves in the population accounting for infant and maternal mortality. By 2012, the European TFR had dropped well below replacement rates to 1.72. In many countries, such as Germany and Italy, the number of deaths in a given year are greater than the number of births. Many European countries only grow their populations through immigration—often from non-Catholic countries. By comparison, in Sub-Saharan Africa the TFR in 1980 was 6.76. Here too, as nearly everywhere else in recent decades, fertility rates have declined. The most recent estimate in 2012 for Sub-Saharan Africa was a TFR of 5.15—still well above replacement. 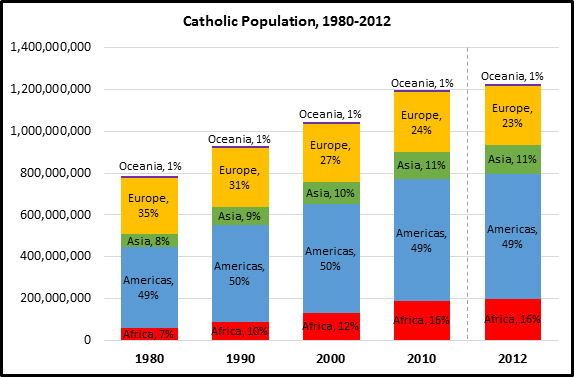 Thus, strong growth in the number of Catholics in Africa relative to in Europe is more a phenomenon of differential fertility than immigration or evangelization. Latin America and the Caribbean have historically also had higher levels of fertility than Europe and North America, leading to strong growth in the number of Catholics in this region. In 1980 the TFR for Latin America and the Caribbean was 4.2. By 2012, this had declined to 2.18—where Europe was in 1980. Population growth in Latin America and the Caribbean will also soon stall as its TFR will likely fall below the replacement rate in the coming decades. Over the last 50 years the proportion of the global population who are Catholic has remained remarkably steady at about 17.5 percent. Most demographers anticipate a global population exceeding 10 billion by 2100, up from 7.3 billion now. The “engine” of population growth is no longer increasing numbers of children—it is extending life expectancies. The U.S. Census Bureau expects the global senior population (ages 65 and older) to increase from about 617,097,000 now to 1,565,844,000 in 2050. That is growth of 154 percent in just 35 years. The annual number of births worldwide is actually expected to decline during this period by 2 percent, numbering just over 130,000,000 each year. In 2000, the world reached an important milestone: “peak childhood.” From then to now and into the future we can expect there to be about 1.9 billion children (under age 15) around the world at any time. 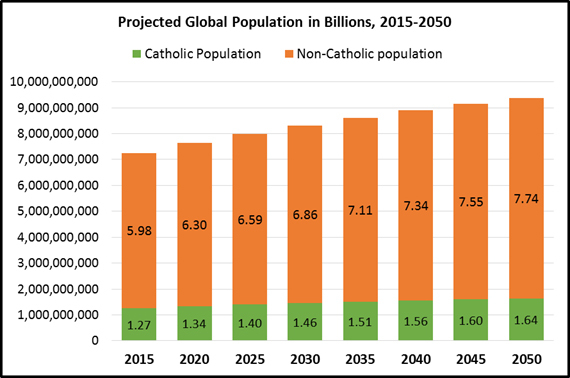 If current trends continue, we can expect the global Catholic population to increase by about 372 million from 2015 to 2050. This would represent 29 percent growth during this period and result in the 2050 Catholic population numbering 1.64 billion. Since 1980, the Church has had a net gain of more than 15,200 parishes representing 7 percent growth. However, with the population growing by 57 percent during this period there has been a lag in constructing the brick and mortar of the Church. In 1980 there were 3,759 Catholics per parish in the world. This figure now stands at 5,541 Catholics per parish. Underlying the aggregate numbers, there are significant changes within regions. 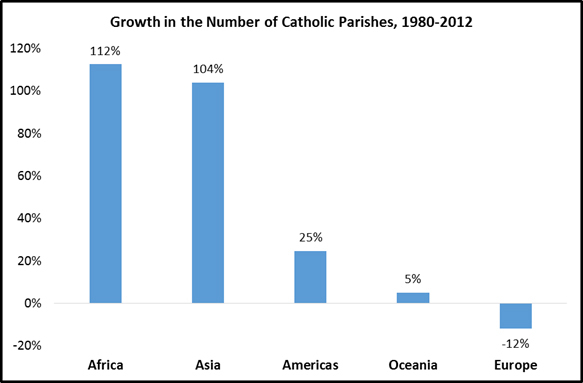 In Asia and Africa, where the fastest growth in the Catholic population has occurred, the number of parishes had doubled since 1980. In the Americas, the number of parishes has increased by 25 percent and in Oceania they have ticked up by 5 percent. In Europe, the number of parishes has declined by 12 percent with a net loss of 16,669 parishes since 1980. The Church is currently undergoing a dramatic realignment due largely to these differential growth patterns. The parishes that served the Church for hundreds and hundreds of years are no longer closely aligned with the world’s Catholic population and certainly not its most frequently Mass attending populations. However, there is no giant crane that can pick up a parish from Europe and relocate it to Africa. The process of realignment is slow given the autonomy of the Church’s diocesan and parish structures. Bishops and pastors do not always have the most current information globally on the changes in their population. Nor does closing parishes in one diocese present a “savings” to another diocese so that a new parish can be built. The Church does not function like a multinational corporation. 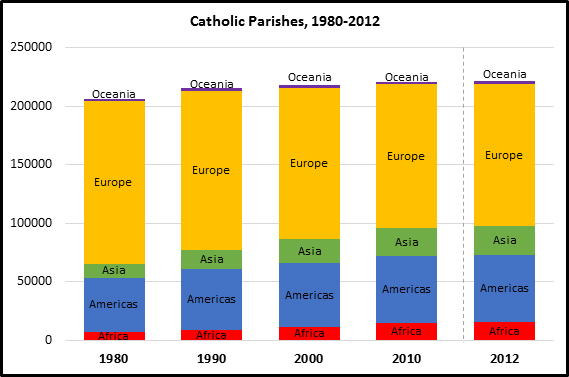 To maintain the current ratio for Catholics per parish in 2050, the Church will need to increase its total number of global parishes by about 75,000 to approximately 300,000. One of the limitations on the construction of a new parish is the availability of priests to pastor these new communities. Globally, the Church had only 713 more priests, diocesan and religious combined, in 2012 than it did in 1980. The most serious decline was in Europe, which had a net loss of 56,830 priests during this period, representing a 23 percent decline in this population (Note: a previous version of the study incorrectly tallied the number of priests in Europe in 2012 at 165,229 when this was actually 186,489 as noted correctly below). Where the Catholic population is growing, so are the numbers of priests. 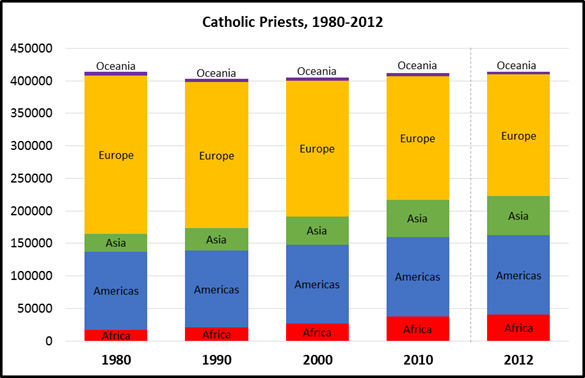 The number of priests more than doubled in Africa (adding 22,787 priest for a 131 percent increase) and Asia (adding 32,906 priests for a 121 percent increase) between 1980 and 2012. A growing phenomenon within the Church is the use of African and Asian priests in the United States, Europe, and elsewhere where there are too few native priests to staff parishes. 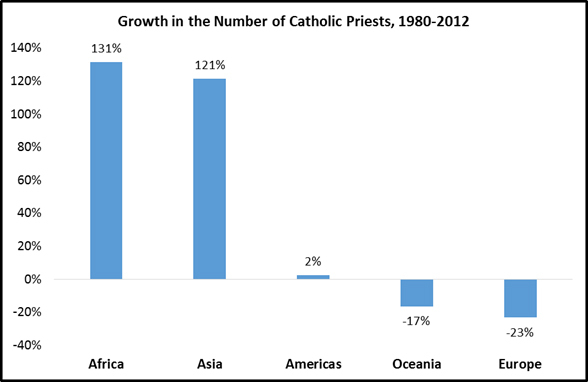 Globally, the ratio of Catholics per priest worsened, as the number of Catholics per priest increased from 1,895 in 1980 to 2,965 in 2012. Given the prevailing trends for population, parishes, and priests, the Church is likely to continue to realign in the coming decades. In 2012, Europe was home to less than one in four Catholics (23 percent). Yet this region still has 55 percent of all Catholic parishes and 45 percent of all Catholic priests. It is likely that Europe faces a future of fewer priests and more parish closures while growth in priests and parishes is likely to continue in Asia and Africa. The Catholic population of Europe in 2050 is expected to be about 5 percent smaller than it is today, due to sub-replacement rate fertility and immigration adding few Catholics to the overall population. Even with fewer Catholics and relatively low levels of weekly Mass attendance, the Church in Europe will struggle in the future to provide access to Masses and sacraments in its many parishes given its rapidly declining population of priests. This will likely negatively impact levels of sacramental practice that have already been ebbing in recent years. Diocesan bishops, priests, and deacons are increasing in number in the Americas as the number of religious priests, brothers, and sisters decline. The Catholic population of this region is expected to grow from 598.8 million now to 690.1 million in 2040. This region is in need of many new parishes, with the ratio of Catholics per parish currently exceeding 10,000. Sacramental practice in the Americas has been waning and some of this may be related to issues of access to nearby parishes with available priests. In Africa, high fertility rates and expanding life expectancies will dramatically increase the number of Catholics from 198.6 million now to 460.4 million in 2040. Although the number of priests, religious sisters, and parishes are expanding quickly here, these will undoubtedly lag behind population growth. More parishes are needed as weekly Mass attendance levels among African Catholics averages 70 percent. The numbers of baptisms and first communions in Africa are rising annually but numbers of confirmations and marriages have recently leveled off. In Asia, the Catholic population is expected to grow from 134.6 million now to 192.6 million in 2040. Here, a slight majority of Catholics, on average, report attending Mass every week and there is no evidence of decline in Mass attendance rates in recent years. There is strong growth in Asia in the numbers of religious priests, brothers, and sisters, as well as diocesan priests. New parishes are also increasing in number. Unlike most other regions, the Church in Asia has experienced growing numbers of marriages in the Church. In 1980 there were about 381,700 marriages celebrated in Asian parishes. In 2012, 626,380 marriages were celebrated here. Trends in the Church in Oceania tend to fall between those of Europe and the Americas. Relative stability is expected here in the coming decades. CARA transcribed Vatican data from the Annuarium Statisticum Ecclesiae for 1980, 1990, 2000, 2010, and the most recent year available, 2012. Additionally, CARA referenced statistics in the Vatican’s Annuario Pontifico when necessary. Where possible, CARA also provides projections for data into the future using statistical forecasting and the U.S. Census Bureau’s International Data Base. CARA also references data from publicly available surveys including: The World Values Survey, The Comparative Study of Electoral Systems, The International Social Survey Programme, the regional “barometer series” (e.g., Eurobarometer, Latinobarómetro), as well as recent research from the Pew Research Center on Global Christianity. In addition to managing surveys in the Americas for the first wave of the World Values Survey in the 1980s, CARA has previously explored global trends in the Catholic Church with Global Catholicism: Portrait of a World Church (2002). Global data are also always available on our Frequently Requested Church Statistics page.